Here's another photo blog summing up the last few crazy days on the farm. Oh no! Another breakout! Whatever shall we do? Escaping pig! You'd better run...Indy's on the job! 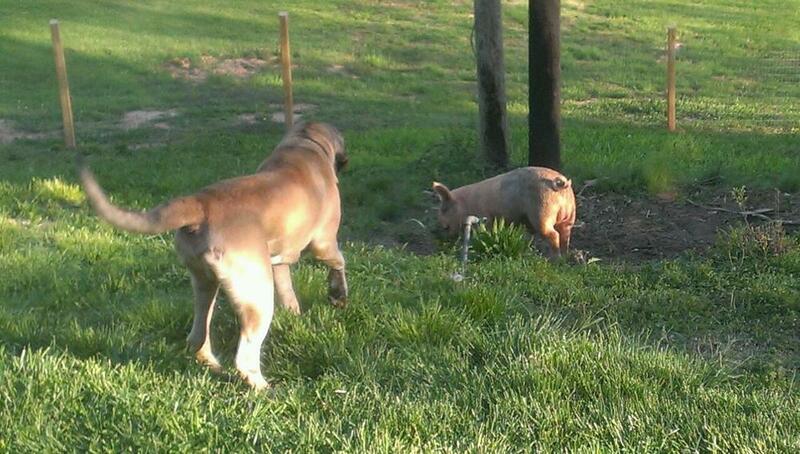 "That piggy's not supposed to be in the yard, is he?" This little piggy cried, "Wee, Wee, Wee!" All the way home. And the mighty hero rests with his fan club. Posted on April 24, 2013 by Erica Lucke Dean and tagged photos pigs chickens mastiff lazy day on the farm.